Jordan Hamilton brings up the ball. The sophomore guard hit a game-winning shot to beat Wisconsin last season. 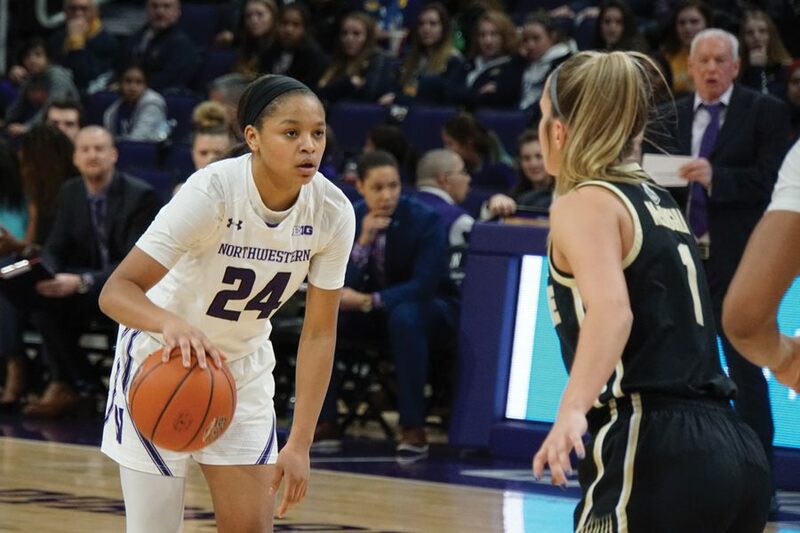 The new Welsh-Ryan Arena may only have three above-ground floors, but Northwestern will look to keep conference foe Wisconsin firmly entrenched in the Big Ten basement when the teams clash in Evanston on Sunday. The matchup projects to be a defensive slugfest, with the Wildcats (10-7, 3-3 Big Ten) and the Badgers (10-8, 1-5) boasting two of the top five scoring defenses in the conference. NU will also have to match Wisconsin’s conference-leading effort on the boards, relying on senior forward Pallas Kunaiyi-Akpanah and junior center Abbie Wolf to gobble up missed opportunities in the painted area. Additionally, sophomore guard Lindsey Pulliam will look to extend her scoring form of late that includes two outings with more than 20 points in her last three games. After this week’s upset win over No. 25 Indiana, Pulliam said the positive atmosphere in the locker room was starting to grow. The Badgers are currently on a four-game skid, their longest of the season, after losing to No. 23 Minnesota 78-50. Against the teams’ six common opponents, Northwestern has the narrow edge, going 4-2 in those contests while Wisconsin sports a 3-3 record. Wisconsin largely runs its offense through the frontcourt tandem of forwards Marsha Howard and Imani Lewis, the only Badger players to average double-digit scoring figures on the year. Howard, who hails from a southern suburb of Chicago, may have extra motivation in her final test in Evanston, as she has gone 0-2 in her previous homecoming games. With playmaking junior forward Abi Scheid likely missing another contest with an undisclosed injury, younger players such as freshman guard Veronica Burton have been given the chance to step up in her stead. With 19 points in the win over Indiana, Burton was a key contributor to the offense and stretched the floor with her success behind the arc. Burton said she hopes the team can keep the success going and continue to play well in the conference. Through three home conference games, the Cats have outscored their opponents by 28 points and will look to add on to Wisconsin’s away woes this season. The Badgers have struggled mightily away from the Kohl Center, mustering only two wins on the road against mid-major Milwaukee and Tennessee State. Pulliam, an emerging leader for the young NU group, succinctly put her confidence in the team on display. “Look out for us, because we’re coming this year in the Big Ten,” Pulliam said.